Laike located in Nanjing (China) has developed the LCminiPCIe-431/432 product. It provides up to two CAN ports running up to 1 Mbit/s. Founded in 2008, Laike is a provider of hardware, software, and services for the mobile and industrial communication sector with emphasis on the Classical CAN and CAN FD products. 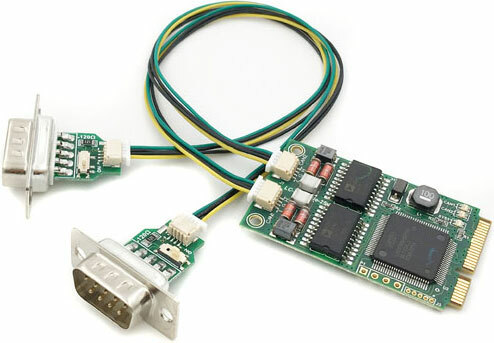 The LCminiPCIe-431/432 card enables the connection of embedded PCs and laptops with PCI Express Mini slots to CAN networks. The CAN ports provide a galvanic isolation of up to 2500 V between host computer and network. The product is available in CAN single- or dual-channel versions. The board embeds a 16-MHz Cortex-M3 micro-controller with on-chip CAN controllers compatible with NXP’s SJA1000 stand-alone controller. The product is equipped with ADM3053 CAN transceivers from Analog Devices. The 120-Ω termination resistors can be switched-off. The pin-assignment of the 9-pin Dsub connectors complies with CiA 303-1. The Chinese supplier provides also low-level driver software for Intime, Linux, QNX, Ubuntu, Vxworks, and Windows operating systems. In addition, the LCAN-Basic programming environment is available. This includes the LCAN monitor running under Windows.